several things can happen to affect their health. the gums and bone. But it doesn’t stop there. throughout the body through the bloodstream. the liver, kidneys and even the brain. Fortunately, oral disease can be prevented. Mercy Pet Hospital was voted 2013 Best of Citrus Heights for Veterinary Hospitals! CITRUS HEIGHTS April 19, 2013 — Mercy Pet Hospital has been selected for the 2013 Best of Citrus Heights Award in the Veterinary Hospital category by the Citrus Heights Award Program. Each year, the Citrus Heights Award Program identifies companies that we believe have achieved exceptional marketing success in their local community and business category. These are local companies that enhance the positive image of small business through service to their customers and our community. These exceptional companies help make the Citrus Heights area a great place to live, work and play. Various sources of information were gathered and analyzed to choose the winners in each category. The 2013 Citrus Heights Award Program focuses on quality, not quantity. Winners are determined based on the information gathered both internally by the Citrus Heights Award Program and data provided by third parties. The Citrus Heights Award Program is an annual awards program honoring the achievements and accomplishments of local businesses throughout the Citrus Heights area. Recognition is given to those companies that have shown the ability to use their best practices and implemented programs to generate competitive advantages and long-term value. The Citrus Heights Award Program was established to recognize the best of local businesses in our community. Our organization works exclusively with local business owners, trade groups, professional associations and other business advertising and marketing groups. Our mission is to recognize the small business community’s contributions to the U.S. economy. Did you know cats can get Heartworm too? Cats are getting heartworm far more often than previously thought. I was a skeptic about the frequency of feline heartworm infection, so I conducted a yearlong study examining shelter cats in the Gulf Coast area. The results certainly got my attention. I found that 26 percent of the cats had been infected with heartworm larvae at some point in their lives, and I found adult heartworms in 10 percent of the cats. Compare this to the feline leukemia (FeLV) infection rate of 5 percent and feline immunodeficiency virus (FIV) rate of 6 percent, and you can see that feline heartworm is much more widespread. Indoor cats are not impervious to heartworm. A study conducted by North Carolina State University found that 27 percent of the cats diagnosed with heartworm were inside-only cats. It takes only one mosquito to infect a cat, and because mosquitoes can get indoors, both indoor and outdoor cats are at risk and should receive heartworm preventive medication. The name “heartworm disease” is a misnomer for cats, as the worm mostly affects the lungs and not the heart. The most common signs of feline heartworm disease are coughing, vomiting and difficulty breathing, but can also include: anorexia, blindness, collapse, convulsions, diarrhea, fainting, lethargy, rapid heart rate, weight loss and sudden death. The signs of feline heartworm disease are often mistaken for feline asthma, allergic bronchitis or other respiratory diseases, so cats with heartworm disease may be misdiagnosed. A cat may even exhibit no signs at all and die suddenly. Because cats are unique in how their respiratory systems react to heartworms, a new name has been given to this set of symptoms: Heartworm Associated Respiratory Disease, or HARD. Cats that suffer from HARD can have difficulty breathing and can die from the disease. There is no effective way to cure the disease once an infection occurs. With dogs, heartworm typically isn’t a problem until the worms reach the adult stage and lodge in the pulmonary arteries and heart. Cats, however, do not need an adult heartworm to show signs of the disease; in fact, larvae are a main cause of the problems. 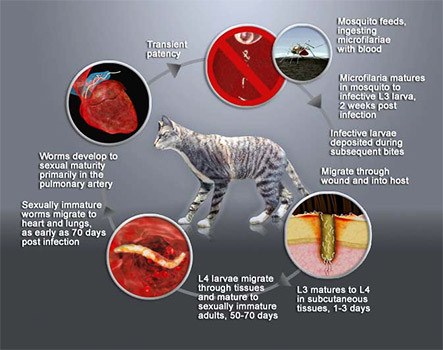 Studies show 50 percent of cats infected with heartworm larvae have significant damage to the small arteries supplying blood to the lungs. Diagnosis is much more difficult for cats than it is for dogs, and tests are not the final word on infections. The tests most commonly used in dogs only detect adult female worms. Since most cat infections do not make it to the adult stage, and those that do may only have male worms, many infections are missed by current testing practices. If your cat is showing signs of heartworm disease, talk to your veterinarian. Treatment of heartworm is often ineffective or problematic in cats. That’s why prevention is the very best strategy for controlling the disease. For more information, visit www.knowheartworms.org, www.heartwormsociety.org orwww.petsandparasites.org. The referral incentive promotion has been wonderful and we are so glad you are all enjoying it! We just wanted to give you a head’s up that the promotion will be suspended as of May 31, 2013. Thank you so much for referring us to your friends and family! We hope you will continue to do so. February is Pet Dental Awareness Month!!! Are you giving lip service to your pet’s dental care? If your pet is 3 years or older, the chances are good that he or she has dental disease. Dental disease can cause serious health problems in dogs and cats — ranging from tooth loss to systemic disease and even organ damage. The good news is that preventive care and regular dental checkups can significantly improve your pet’s health and quality of life. Go to the Coupons & Promotions tab to view and print valuable coupons!!! We’d love to give your pet something to smile about!